Bluetrek have launched the "Sense" - a touch-sensitive Bluetooth headset. The feature that really sets this headset aside from its rivals is the ability to answer calls by simply tapping the touch-sensitive key. Many people complain that the force required to press the mechanical buttons on standard headsets will dislodge the position of the headset in your ear. It also features Bluetreks new Voice Alert feature which will remind you of the headsets actions such as: redial the last number, reject call, if your headset is connected/disconnected etc. The Bluetrek sense has been designed with fashion in mind and features a piano glass finishing. The Groundsurf is a three wheeled skate board designed by Paris based company Ratleads and has the unique feature of Bluetooth remote control. It has an electric motor driving the front wheel, a 3 dimensional cinematic rear truck, sensors as detection systems, sensor pads on the board as motor remote control (you lean forward to accelerate and backwards to slow down or brake). Now for the really unique feature, the motor control system can optionally be remote controlled from a Bluetooth enabled touchscreen phone. Sliding your finger up the phones screen will make the board go faster and sliding your finger down the phones screen will make the board slow down. I'm sure glad they didn't control the steering this way! The groundsurf is scheduled for launch by a famous Californian surf brand in 2008. 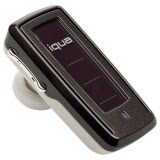 Iqua have made available the worlds first solar powered Bluetooth headset, the Iqua 603 Sun. The Iqua Sun features a photovoltaic cell that uses any available light - indoors and outdoors - to keep itself charged and extend the operation time. It also comes with a charger and requires and initial 2 hours of charging, after which it provides up to 12 hours of talk time and unlimited standby time when exposed to ambient light. The Iqua 603 Sun features the standard Bluetooth headset features, call, redial, voice dial and lets you switch between your headset and phone using a single button. Gear4 launch the BluFM, a car kit device that transmits music to your cars stereo from an MP3 player over FM radio. The BluFM is powered from your cars cigarette lighter and is compatible with any MP3 player via its 3.5mm plug. It can also be paired with a Bluetooth mobile phone, allowing you to talk and listen through your cars stereo hands-free using its built in microphone and FM transmitter.